The home side are massive underdogs for the clash against the champions with Jim McIntyre’s men toiling at the bottom end of the Premiership having lost their last three games in a row while the Hoops are once more out in front at the top of the table as they close in on yet another title. However, Englishman Ralph insists that while you would receive long odds on Dundee even taking a point against Neil Lennon’s team, there is still belief within the Dens dressing-room that they can cause an upset in the game that will be shown live on Sky. The 26-year-old former Woking Town defender said: “Everyone knows how big a team Celtic are so it will be tough but anything can happen especially with us at home. So I am looking forward to it. “I have said it before that one of the big reasons for coming up to Scotland was playing against top teams. “The first time I played Celtic (in December at Parkhead) it ended up 3-0 but it was in front of 60,000 and it was a great atmosphere. “It was the biggest crowd I had played in front of so it was a good experience apart from the result. “On Sunday we have to be more solid at the back and try to make it as hard as possible for them. “We will be underdogs but we will all go into the game believing and give it 100%. “The pressure is more on them than us to win. “We just need to go out there, express ourselves and play to our best. After playing non-league football down south last season, Ralph admitted that it has been a big learning curve for him in Scotland. He added: “Yes, it has. It has been good to test myself against the likes of Daniel Candeias at Rangers and James Forrest at Celtic. “Their movement is at a different level so you have to be extra focused all the time. “I have really seen a difference playing against teams like that. It has been good facing up to the challenge. “Another reason why I came up here is to get my name out there and it has probably raised my profile. 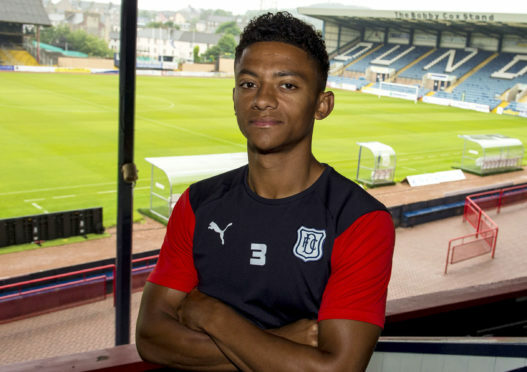 “I think the Scottish game in general this season has become more high profile in terms of the likes of Steven Gerrard and Jermain Defoe coming up. “So more people are looking at it. With the profile of the Scottish game being so high at the moment, Ralph acknowledged that it was even more important that Dundee secure their top-flight safety for next season. He added: “Definitely, and I think we will. “The St Mirren game after the international break will probably be the biggest of our season so far. Ralph was one of former boss Neil McCann’s summer signings and is one of the few survivors of that recruitment campaign following the January clear-out by current manager McIntyre. Ralph said: “It only feels like yesterday since I joined the club but there has been a lot of change. “For myself personally I have really enjoyed the second part of the season. Obviously, it is disappointing with the position we are in but for me to be playing and be injury free, I can’t complain really. Meanwhile, McIntyre confirmed that striker Andrew Nelson will definitely miss the Celtic match as he slowly recovers from a heel injury. The manager said: “Nelson isn’t back on the training ground yet. “It has been slower than expected and it is frustrating but it is improving. McIntyre added: “It doesn’t get any tougher than facing the champions. “They are obviously doing very well again this season. “Nothing changes – any time you come up against a top team you need to be at your best from one to 11. “That’s what we know it is going to take to get a result. “Having said that there are always upsets every season and that’s exactly what we will try to do. “We have to make sure we are dogged, determined and organised.